We have 11 members of staff all specialist within the trade, Our day to day experience, ensures the best possible service and advice. We cover the North Shore, but can visit any where in Auckland. We offer a FREE QUOTE and advice. Leather cleaning will definitely prolong the life of your leather furniture, in some instances extending the life of your leather furniture by some years. Whether its your furniture, car seats, helicopters or boats. We have a mobile service and offer a free in house demonstration. 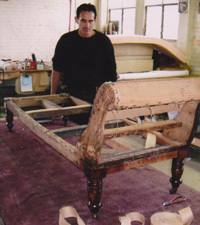 Bruce Withers Upholstery and Leathercare Ltd team of experienced craftsmen are highly skilled in all types of repair, renovation and recovery and restoration work on all your beloved pieces of furniture, including antique nails, braiding, webbing springs ext. Offer advice on stain guarding your furniture. 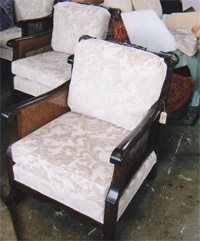 When considering re-upholstering your furniture there are several reasons in which to do so. 1. Can not find the same style and quality of furniture. 2. Family heirloom with sentimental value . 3. Will the 'base' of the furniture be suitable for re- re- upholstering. The wear standard is judged by a Martindale rub test 20,000 rubs to be classed as general upholstery fabric. Has approximately 22,000 fabric samples, 200 vinyl/canvas, 150 leather.